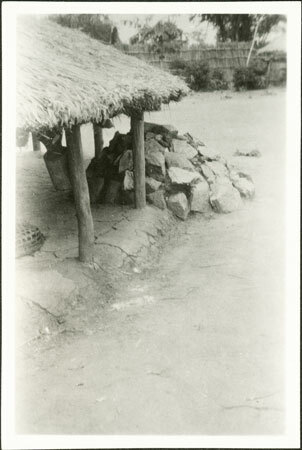 A stone grave mound partly under the eaves of a hut in a compound where an informant, Bambatu, resided. Such mounds (a cultural borrowing of the later 19th century from the Bongo or possibly Amadi) are made during a mortuary ceremony (pombú) of complex rites and observances. Just to its left under the eaves can be seen a memorial carving, another cultural borrowing from the Bongo. Morton, Chris. "Zande grave mound" Southern Sudan Project (in development). 03 Jan. 2006. Pitt Rivers Museum. <http://southernsudan.prm.ox.ac.uk/details/1998.341.242.2/>.